Displacement-Time graph is important to interpret mathematical expression into picture as a graph. Graph gives a short cut idea about the concept of the mathematical statement. 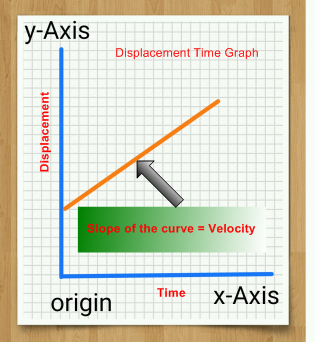 In Displacement time graph the slope of the curve is the velocity. If the curve is straight line then it means that the velocity is constant. In a graph the straight line is called a curve despite it may be a straight line. Watch the video. displacement-time straight line curve and its meaning. Two curves have shown to physically interprete the race competition of two person. When displacement-time curve takes the shape of a parabola.